Built in 1927, this Chicago hotel is one block from Michigan Avenue shopping and Rush Street restaurants and nightlife; Lake Michigan is within five blocks. If you're looking for a great (and cheap!) hotel in Chicago, CheapTickets is the best place to find them. 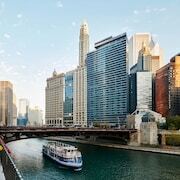 We offer deals on the best 791 hotels throughout Chicago. No matter what you're looking for, we have options for you. Grab great rates on the 284 affordable 3-star hotels that are easy on the wallet without sacrificing comfort. Looking for more luxury? Try one of the 111, 4-star hotel accommodations in Chicago. No matter your budget needs, we've pulled out all the stops to make sure you have plenty of vacation options. Maybe you prefer to search for your hotel deals based on what each hotel offers? For example, let's say you just want to find a hotel or resort that has a pool to cool off in after a long day exploring Chicago. Scroll down to choose from the 473 hotels in Chicago that has a pool for guests. Or search for deals on Chicago hotels offering free wifi or breakfast, non-smoking rooms, and more! CheapTickets is here to be your personal travel agent for your next trip to Chicago. Get booking today! What hotels in Chicago offer free wifi access? Are there deals on Chicago hotels offering free breakfast? Yes! The only thing better than finding a great deal on a cheap hotel in Chicago is finding one that offers free breakfast. Grab some eggs, a waffle, or some healthy oatmeal before a day full of exploring Chicago and all that it has to offer. Below are just some of the many hotels that offer free breakfast in Chicago. 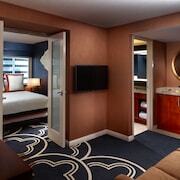 Sofitel Chicago Magnificent Mile is a 4.50 star rated hotel property in Chicago that offers free breakfast. 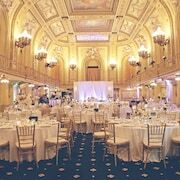 The Whitehall Hotel is a 4.00 star rated hotel property in Chicago that offers free breakfast. Motel 6 Naperville- IL is a 2.00 star rated hotel property in Chicago that offers free breakfast. Crowne Plaza Hotel Chicago O'Hare is a 3.50 star rated hotel property in Chicago that offers free breakfast. What about deals on pet-friendly hotels in Chicago? Chicago is a great place to get outside and explore with your pets in tow so don't leave your furry friends behind. Below you'll find great deals on hotels in Chicago that allow pets. Don't forget to bring plenty of treats! 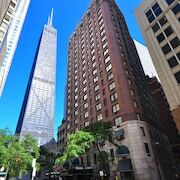 Swissotel - Chicago is a popular, pet-friendly, 4.50 star hotel in Chicago. Hotel Felix Chicago is a popular, pet-friendly, 4.00 star hotel in Chicago. Sheraton Grand Chicago is a popular, pet-friendly, 4.00 star hotel in Chicago. Warwick Allerton - Chicago is a popular, pet-friendly, 4.00 star hotel in Chicago. Any good rates on Chicago hotels with restaurants? Absolutely. Don't want to deal with planning our all your meals on your trip to Chicago? We don't blame you. Keep the hangry away by staying in one of the 260 hotels that have restaurants. With a room at one of these spots, all it takes to get a good meal is hopping in the elevator. Check out some of the most popular hotels in Chicago that have restaurants below. Book Central Loop HotelCentral Loop Hotel is a 4.00 star hotel and has one or more restaurant options. Book Hilton Chicago- Michigan Ave Cultural MileHilton Chicago- Michigan Ave Cultural Mile is a 4.00 star hotel and has one or more restaurant options. 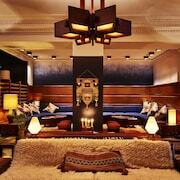 Book The Godfrey Hotel ChicagoThe Godfrey Hotel Chicago is a 4.50 star hotel and has one or more restaurant options. Book Raffaello HotelRaffaello Hotel is a 4.00 star hotel and has one or more restaurant options. What are the cheapest hotels in Chicago with pools? What's better after a long day exploring Chicago then a relaxing dip in a pool? Finding the Chicago hotel you need for a bargain! Cool off and unwind at one of our 473 Chicago hotels with a pool. Browse some of the top deals on these hotels and resorts with pools in Chicago below, but be warned: You may not want to check out! Millennium Knickerbocker Chicago has a pool and a 4.00 star rating. Cambria Hotel & Suites Chicago Magnificent Mile has a pool and a 4.00 star rating. Loews Chicago Hotel has a pool and a 4.50 star rating. Hyatt Centric Chicago Magnificent Mile has a pool and a 4.00 star rating. What hotels in Chicago offer parking for guests? Once you've made your way to Chicago, the last thing you want to deal with is finding parking close to your hotel. Avoid the hassle of parking around the block and carrying your luggage all the way to the lobby by booking one of our hotels with parking. Check out deals on some of the 569 hotels in Chicago that offer parking for guests. River Hotel This hotel has a 4.00-star rating. Motel 6 Elk Grove Village This hotel has a 2.00-star rating. Kimpton Hotel Allegro This hotel has a 4.00-star rating. Hyatt Regency Chicago This hotel has a 4.00-star rating. Do Chicago hotels offer 24-hour concierge services? When you're on vacation, things don't always go according to plan. Travel with peace of mind when you book one of our 181 hotels in Chicago with 24-hour concierge service. That way you know help is always phone call or elevator ride away. Try Inn of Chicago. It's a 3.00 star rated hotel in Chicago that offers concierge services 24 hours a day. Try Raffaello Hotel. It's a 4.00 star rated hotel in Chicago that offers concierge services 24 hours a day. Try Chicago South Loop Hotel. It's a 3.00 star rated hotel in Chicago that offers concierge services 24 hours a day. Try Hyatt Regency O'Hare. It's a 4.00 star rated hotel in Chicago that offers concierge services 24 hours a day. What about low rates on non-smoking hotels in Chicago? The St. Clair Hotel This hotel has a 2.00-star rating. Congress Plaza Hotel This hotel has a 3.00-star rating. Club Quarters Hotel- Central Loop This hotel has a 4.00-star rating. Kinzie Hotel This hotel has a 4.00-star rating. What are the cheapest Chicago 3-star hotel deals? Our 3-star hotels bring you quality accommodations at a lower price point for the perfect, budget-friendly vacation in Chicago. With 284 3-star hotels throughout Chicago to choose from, you still have options. Browse our selection below. Congress Plaza Hotel. Built in 1893, this downtown Chicago hotel offers a convenient location across from Grant Park and close to Lake Michigan. DoubleTree by Hilton Chicago - Magnificent Mile. Located in the northern part of downtown, Doubletree Chicago Magnificent Mile is 2 blocks from Magnificent Mile shopping and dining, 3 blocks from Lake Michigan, and 5 blocks from Navy Pier amusements. Hyatt Place Chicago/River North. Three blocks from the river, Hyatt Place Chicago/River North is on a lively street in downtown Chicago. It's just north of the corporate hub, The Loop, and a 15-minute walk from sights such as the Art Institute of Chicago. O'Hare International Airport is less than 20 miles (32 km) away. Chicago South Loop Hotel. Located in South Loop, this spa hotel is within 1 mi (2 km) of Illinois Institute of Technology and McCormick Place. US Cellular Field and Soldier Field are also within 2 mi (3 km). What are the best deals on 4-Star Hotels in Chicago? Chicago is full of hotels and it can be hard to narrow down where you really want to stay. Luckily, we've done that hard work for you be narrowing you from 791 hotels throughout Chicago, to the 111 4-star hotels in Chicago. Our 4-star hotels in Chicago are exactly what you need for your next family trip, romantic weekend, or solo getaway. Check out our most popular deals below. 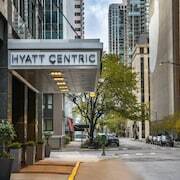 Hyatt Regency Chicago: This Magnificent Mile hotel is located among Chicago's world-class shopping, restaurants and attractions. The Navy Pier, Millennium Park and Art Institute are less than a mile away. Hard Rock Hotel Chicago: On Michigan Avenue and across from Millennium Park, this rock-inspired hotel occupies the 36-story, Art Deco-style Carbide and Carbon Building in downtown's Loop; Macy's is a block away. Warwick Allerton - Chicago: Located on Michigan Avenue in the middle of Chicago&#39;s Magnificent Mile, this 1920s Italian Renaissance hotel is surrounded by fashionable shops, 1 mile from Lake Michigan and the Art Institute. Hyatt Regency McCormick Place: Connected via enclosed skybridge to the McCormick Place convention complex, the Hyatt Regency is adjacent to a Metro station, with easy access to Chicago's downtown hub. Soldier Field, the home of the Chicago Bears, is a 15 minute walk away. What are the best activities to do in Chicago? 360 Chicago Observation Deck (formerly John Hancock Observatory): Starting at just $33 per person. Sparkling Chicago: 360 Chicago Observation Deck for 2 with Prosecco: Starting at just $31 per person. Art Institute of Chicago: Starting at just $25 per person. Bikes, Bites & Brews Bike Tour: Starting at just $84 per person. What are the most popular attractions in Chicago? People travel to Chicago from all around to witness the incredible sights and attractions. With 15 sights to see during your stay, you're sure to have a busy trip in Chicago. Below, we've listed some of our favorites. The breakfast is great! So many options and well laid out. Beautiful rooms and great breakfast!!! Friendly staff, very helpful!!!! Well worth the price! My family and I had a WONDERFUL TIME THERE!!!! This is a hotel you must stay at!! I love everything about it. The peoplw are so nice they greet you and make sure they stay on top of your neess! I enjoyed the excellent customer service received from the staff. They were very welcoming and helpful.